I’ve never read it, but will find it in the Chicago Public Library. Don’t consider myself a feminist, because I was raised with three brothers by an extremely independent Mother, a child of the Great Depression. I’ve done ‘men’s’ work and women’s’ work…but I prefer to be simply an artist–no gender required! I enjoy Margaret Atwood’s writing, particularly her short stories. She has a strength that is evident in a lot of female writers and is pronounced in female, Canadian writers. As women, we all need to pay attention. Love Ms. Atwood. Handmaids Tale is awesome. Given today’s political attacks on women I fear it may have foretold the States’ future. Two of my other favorites are as follows: The Edible Woman and The Penelopiad. The CPL has lots of her books. See the search below. Thank you so much, I love it!!!! Thank you. Thank you for your thoughts!!! One of my favorite Authors. Thank you! It has been a long time since I read that book…going to go read her now soon. Thanks for sharing and lifting up a beautiful woman, who lifts up many everytime they read her messages! Thank you so much for your comments, I appreciate them so. 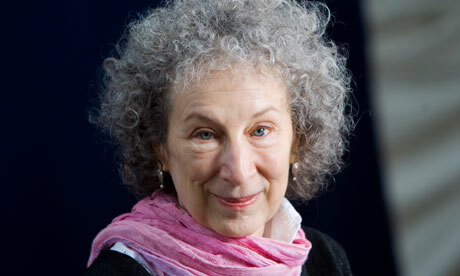 Margaret Atwood is my favorite author, hands down. I have read every one of her books but I think Oryx and Crake is my favorite. But the Handmaid’s Tale is starting to look like pretty ominous right now, with all of the attempts/horrifying successes,of taking our rights away. You would think this could never be possible in this day and age. I’m certainly not going to sit on the curb and watch it happen and if men love their mothers, daughters, wives, friends…they won’t either. I love your passion and your are so right. Thank you so much for your comments, thank you. Thank you for commenting and for appreciating the thoughts!!! Her dystopia is a world without many things. It opens with the news that a rebel nest of Baptists has been destroyed! Does anyone else think she looks like Barbara Streisand? I am not sure. I have not heard from anyone else as of yet. Thanks so much for reading!!! !